The international conference that took place in Tashkent on November 20 discussed the part public organizations were playing in promotion of innovative projects and attraction of investors. The Russian delegation presented the Trans-Asian Corridor of Development, a combination of a canal, highway, and railroad from the Yamal Peninsula to the Caspian Sea and on to the Persian Gulf. Another artery connecting the Caspian Sea and Black Sea will create an integrated system with the Kara Sea and Arabian Sea. Damir Ryskulov, Academician of the International Academy of Information and advisor with the Directorate of Analysis of the Moscow mayoralty, explained what the Trans-Asian Corridor of Development was about. According to the expert, freight traffic between Russia and the Asian countries follows some winding and therefore not particularly cheap routes. A shipment of fertilizers from the Urals takes a month or even longer to reach its destination in India. First, it is ferried by railroad to a port where it has to be loaded on ships (which may take up to two weeks, depending on how busy the port is). After that, it is shipped around China or (if the shipment went via St.Petersburg or Riga) Suez Canal. Poor condition of the transport network and various obstacles double the cost and time, impeding commerce between countries. The Trans-Asian Corridor of Development will take care of it. The Russian Urals region desperately needs a gateway to the international markets. Concentration of industrial production in the Urals is four times the Russian average. This region accounts for more than 92% of gas and 68% of oil production in Russia, 40% of steel production and rolled stock (ferrous metals), and nearly 10% of mechanic engineering products. The Urals Federal Region contains nearly one third of all surveyed reserves of mineral fuel and practically all Russian gas (i.e. 26% of its global reserves). Export traffic routes from the North to the South are needed for liquefied gas, processed timber, and construction materials. Ryskulov therefore suggested all interested parties to join Russia in the Trans-Asian Corridor of Development, a major artery across the territories of Russia, Kazakhstan, Uzbekistan, Turkmenistan, and Iran to the Hindu ports and markets of the United Arab Emirates, Saudi Arabia, Iran, Kuwait, and countries of Southeast Asia. Asia Canal from the cold Kara Sea to the Caspian Sea and to the warm Arabian Sea will become the central element of the Trans-Asian Corridor of Development. Its length from the Kara Sea to Bender-Abbas will amount to nearly 6,600 kilometers. Fifteen meters deep and 100 meters wide, Asia Canal will lose but 7% water to filtration and evaporation. Eurasia Canal is to be built simultaneously with Asia. Connecting the Caspian Sea with the Black Sea via the Azov Sea, it will provide the western route from the port of Turkmenbashi. 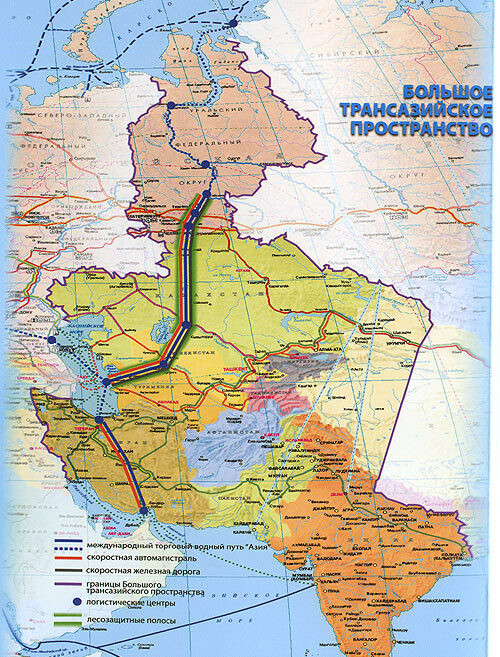 The Trans-Asian Corridor of Development also stipulates construction of a highway from Salekhard to Kurgan to Arkalyk to Kzyl-Orda (with a branch off to Afghanistan via Kabul or Chakhabar and on to Pakistan) to Dashoguz (with a branch leading to Serakhs and on to the Persian Gulf via Iran) to Turkmenbashi. It also stipulates construction of the third element, namely a railroad from Salekhard to Kurgan to Arkalyk to Kzyl-Orda to Dashoguz with a branch off to Serakhs and Turkmenbashi. Forest shelter belts 4,000 kilometers long are to be planted on both sides of the Trans-Asian Corridor of Development. The cost of construction of a canal from the Kara Sea to the Persian Gulf (including one from the Caspian Sea to the Black Sea), railroad, and highway with all infrastructure may amount to $100-150 billion. The construction will take 15 years. Average annual yield is expected at the level of $7-10 billion. All potential of the Trans-Asian Corridor of Development will be fully tapped 20-25 years after the onset of construction. Professor Ryskulov and his working team do think big. History of civilization does not know any projects on so colossal a scale yet. Suez Canal looks like a pitiful creek in comparison. By and large, the project leaves the impression of something from a SF novel but the idea it is focused on is fairly interesting. Anyway, Arthur Schopenhauer once said that "All truth passes through three stages. First, it is ridiculed. Second, it is violently opposed. Third, it is accepted as being self-evident." Authors of the idea only want to attract attention to their project for the time being. They hope to make countries of the would-be Great Waterway interested so that their leaders will order at least a feasibility study and technical and economic assessment of the Trans-Asian Corridor of Development. That expediency of its construction will become clear only after some calculations are made goes without saying. The project already has some powerful supporters in Moscow. They are Mayor of Moscow Yuri Luzhkov (promoter of the idea of a turn of the Siberian rivers to Central Asia) and Khanty-Mansiisk Governor Alexander Filippenko. It was Luzhkov and Filippenko who ordered establishment of the working group of specialists that produced the project of the Trans-Asian Corridor of Development. Presenting the project in Tashkent, authors of the idea tried to gauge the Uzbek authorities' opinion of the whole idea. Moment for the presentation, however, should have been chosen with better care. Persuading the authorities of Uzbekistan to become involved in a project most people view as fantastic is nearly impossible, particularly considering their skepticism with regard to projects of common zones (even applied to commerce alone). Official Tashkent has already made its opinion known. 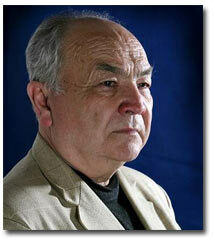 Uzbek TV networks covering the international conference never even mentioned the project.